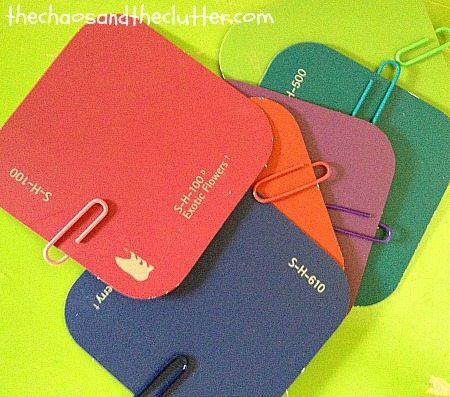 Paint chips are great for making all sorts of crafts and activities with because they come in so many colors and their thickness makes them easy to work with and easy for little hands to handle. There is really no end to what you can do with paint chips. 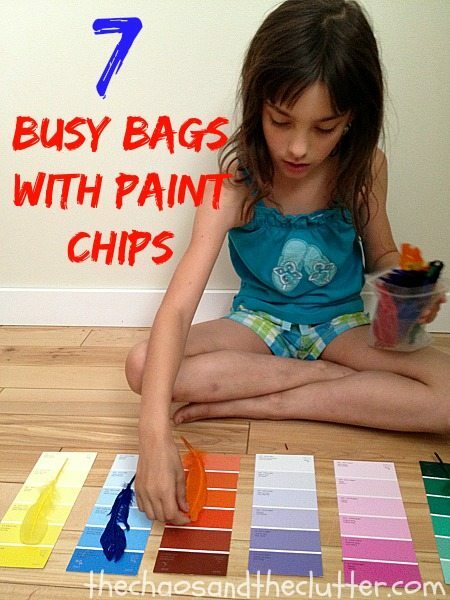 I use busy bags with the younger kids and have made several with paint chips as they are free and due to our recent renovations, we have a lot of them. 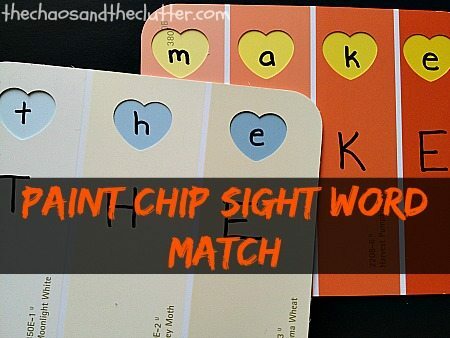 This easy activity is great for reenforcing sight words. I made ours with the sight words the kids are currently learning and can continue to add more. These are so easy to make and don’t cost anything. 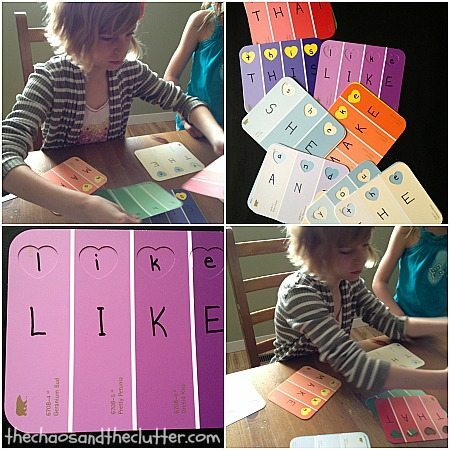 To create these cards, take two paint chips per word and punch large holes in one of them. I used the heart shaped punch again, but regular squares will do. Lay it on top of the other card so that you line up the words properly. Write lowercase letters on one card, through the holes made and uppercase letters on the other. Place them all into a bag. The activity is much more challenging if you use different colours so that the kids have to match them up based on the letters and not based on colour. It doesn’t get much more simple than this! 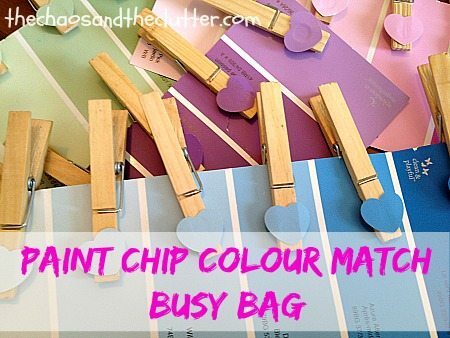 Throw some paint chips and paper clips of the same colour into a sandwich bag and toss it into your busy bag box. Your child can then attach the paper clips onto their same coloured paint chips for colour matching and fine motor skill practise. In order to create this activity bag, you will need to take two identical paint chips and cut a shape out of each shade of colour in one. I used a heart shaped hole punch. Glue these shapes onto the ends of wooden clothespins and place the intact paint chips and the clothespins into a resealable bag. This activity is good as a more advanced colour matching game for kids as some of the shades can be similar and difficult to differentiate. This is a simple bag to put together. Just throw some paint chips and colored pompoms and feathers in a resealable bag. I added some plastic tweezers in case the kids wanted to use those for placing the pompoms on the paint chips. I also threw in three sizes of pompoms so that if they wanted to, they could create patterns with the sizes. I was able to find paint chips that already had a hole punched in the corner but if using paint chips that don’t have this feature, punch a hole into each paint chip, thread them through a binder ring and it is ready to go! 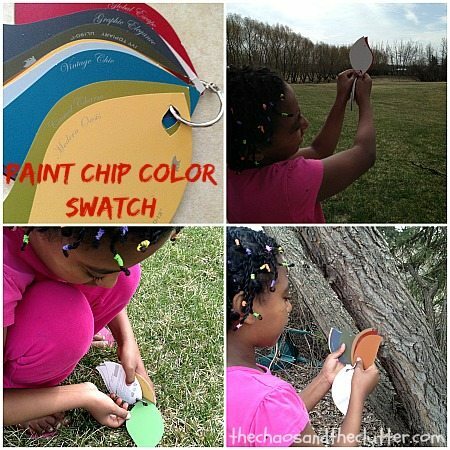 When using this activity, your child can find objects inside or outside that match up with the colors in their color swatch. 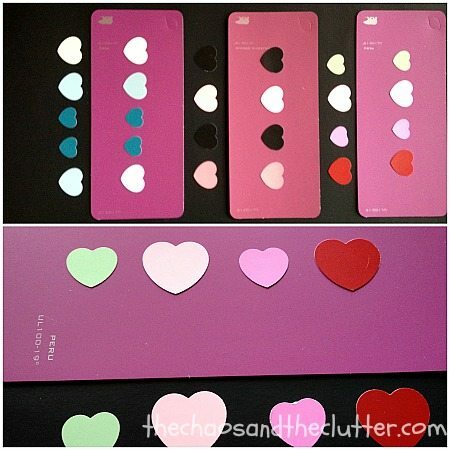 To create these, cut out shapes from paint chips (I used a heart hole punch in two different sizes but you could cut out squares or any other shape) and glue them onto another paint chip. It works best if the paint chip you glue them onto is a long solid coloured one. Cut out identical shapes and colours to enclose in the bag so that your child can recreate the pattern on the cards. 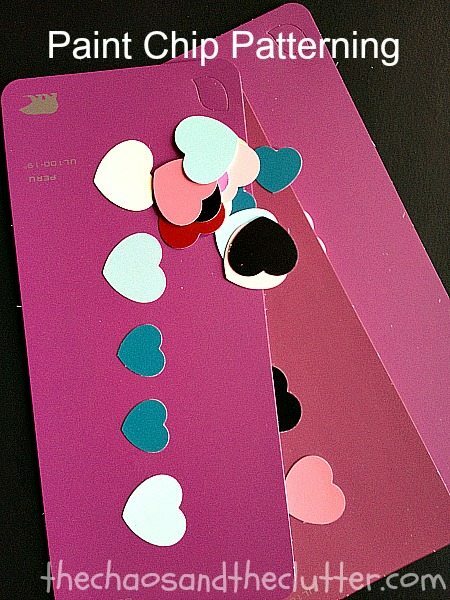 Last year, we made tiny notebooks out of paint chips. The kids each made their own but afterwards, we didn’t do anything with the notebooks until I thought of creating them into easy busy bags. 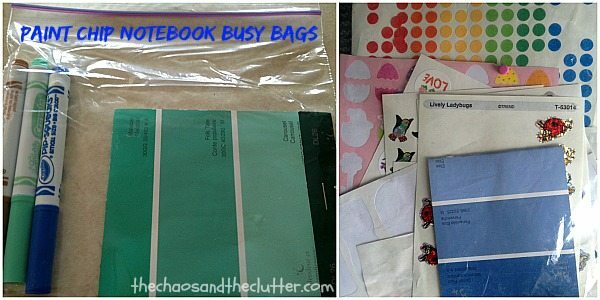 I threw notebooks into resealable bags with stickers or with markers or crayons for the perfect little activity bag on the go! You can read about how we created our paint chip notebooks (by clicking on the highlighted words) and create your own. The kids love them more than other mini notebooks because they are so proud to have made them themselves! If you are looking for other busy bag ideas, you may be interested in following my Activity Bags Board on Pinterest. You might also want to sign up for email updates as I will be sharing many of our simple and inexpensive busy bag ideas in the coming weeks. Busy bags are perfect for bringing on road trips, using in waiting rooms or giving to younger kids while you do homeschooling or homework with older ones. What ingenious uses these are! I can’t wait to try them! 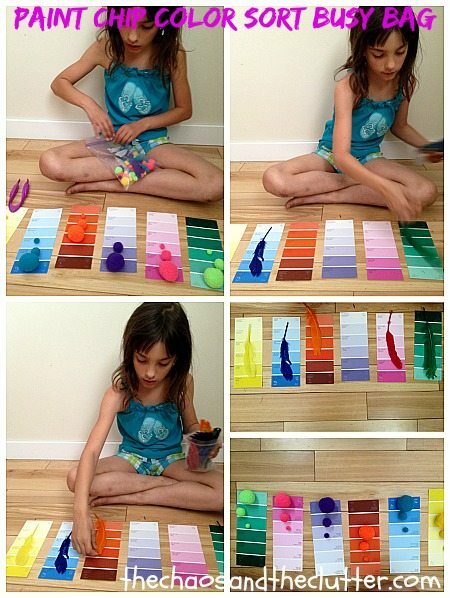 So many fun ideas with paint samples! Love it! Wow, so creative and fun! Who knew there were so many neat things to do with these? 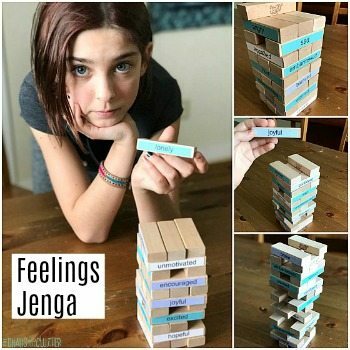 I’ll be adding this to my “Cool School” Pinterest board ~ http://www.pinterest.com/mcmoreau/cool-school/ ~ thanks for pulling these ideas together for us! Wow – love these ideas. I feel a trip coming on to the local DIY store. I wonder how many I can fit in my handbag! Fantastic ideas to use in the classroom as well as at home. Thank you. Hi Sharla. Thanks for linking up at #Pintastic Pinteresting Party. 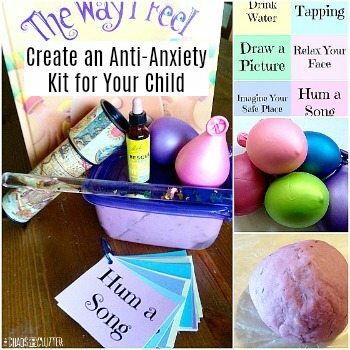 These are very cute ideas for the kiddos. I personally have a lot of paint chips for my own crafting. Always looking for more, but at the moment my poor crafting is on sabatical. Just no time currently but hoping to add it back in soon. 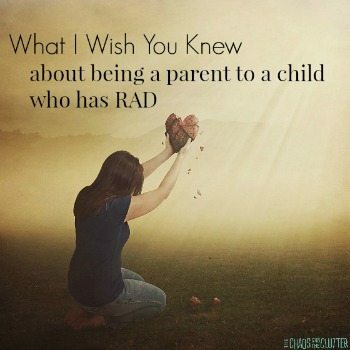 Thanks again for sharing these ideas for the kiddos.